Highlights::View beautiful scenery and natural heritage at Zhangjiajie National Forest Park Appreciate natural sights of trees, mountains, streams and wild lives Enjoy uncanny workmanship by nature in Yellow Dragon Cave. Today's Activities:Fly from Beijing to Zhangjiajie (air fare and tax included, airport transfer in Beijing excluded). Meet your local guide at Zhangjiajie airport and transfer to hotel. Today's Activities:BEIJING (Reuters) - A mountain peak in China's Hunan province, which inspired Golden Globes Best Director winner James Cameron for his latest blockbuster, Avatar, was renamed Avatar's "Hallelujah Mountain". The management committee of the Yuanjiajie part of Wulingyuan Scenic Area in Zhangjiajie changed the name of the "South Pillar of the Heaven" (also called the "Pillar between Heaven and Earth") to "Hallelujah Mountain", a namesake floating island in the movie that circulates in the magnetic currents of the make-believe planet of Pandora. Zhangjiajie is a rising tourist city famous for its unique natural scenery and abundant tourism resources. It is located in the northwest of Hunan province. It was listed into the World Natural Heritage Catalogue by the UNESCO in 1992. 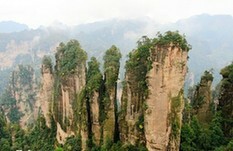 What’s more, Zhangjiajie was awarded the title of “World Geological Park” in 2004. 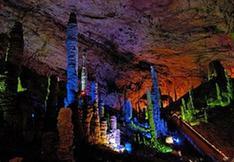 Today's Activities:Today you will take a half day tour to the marvelous Huanglong (Yellow Dragon) Cave. Then transfer to airport for your departure. Fly back to Beijing (airfare and tax included, airport transfer in Beijing excluded).